Popular gun companies Smith & Wesson (SWHC) and Sturm Ruger (RGR) are among the best stocks in America in 2015. It’s a reminder of just how profitable these businesses are. Smith & Wesson has skyrocketed over 80% this year. To put that in perspective, if the stock were in the S&P 500, it would be the second best performer this year, behind only Netflix (NFLX, Tech30). Rival gunmaker Sturm Ruger (RGR) isn’t far behind. It’s up nearly 70% in 2015 alone. This stellar performance comes in a year when many stocks have tanked. Apple (AAPL, Tech30) isn’t even positive for the year, and it’s shaping up to be the worst year for stocks overall since 2008, the year of the financial crisis. The reason investors like gun stocks is simple: people are buying a lot of guns. Sales hit a record for Smith & Wesson in 2014 and for Sturm Ruger in 2013. If the forecasts are correct, this year will be back near those all-time highs or even surpass them. Gun sales took off after President Obama entered the White House on fears that he would put more restrictions on firearms purchases. Those concerns returned after the Sandy Hook massacre in Newtown, Conn. in 2012 as politicians promised changes. However, there hasn’t been any restrictive gun legislation at the national level, and sales have continued to climb. More recently, handgun sales have done well. The gun companies say there’s growing interest in self-defense. Sturm Ruger does over half a billion in gun sales a year now. That’s almost double what it did in 2010. Smith & Wesson is on track for over $600 million in sales this year, according to FactSet. That’s a 50% spike from its 2010 sales. Gun stocks retreated a little recently as America mourned another mass shooting at a community college in Oregon and a number of politicians, especially 2016 Democratic presidential hopefuls like Hillary Clinton and Martin O’Malley, called for stricter gun control measures. “What is wrong with us that we can’t stand up to the NRA and the gun lobby and the gun manufacturers,” Clinton said Friday at a campaign stop in Florida. She has vowed to use executive action if Congress won’t act. Though Clinton’s promise to clamp down on “price gouging” drug companies sent biotech stocks tumbling recently, her comments on guns aren’t having the same impact. On Monday, both gun stocks jumped again — up about 3%. 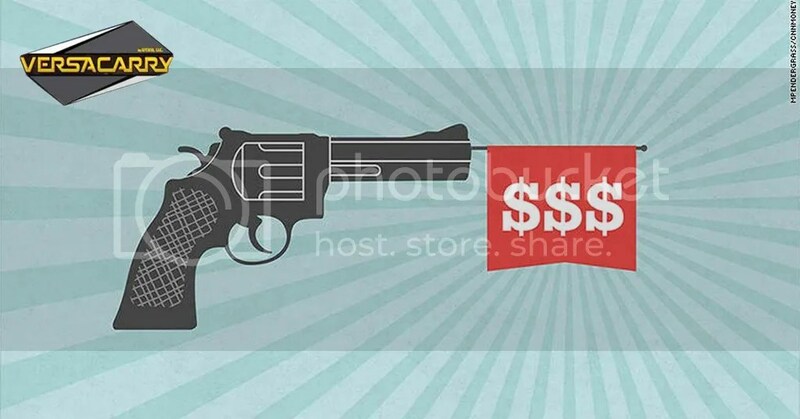 For investors, gun companies have been extremely profitable in recent years. Smith & Wesson and Sturm Ruger stocks have given investors over 320% of gains in the past five years. That’s more than four times better than the return of the S&P 500. It’s even hotter than Apple’s 165% return over the same period.